Gulf Between Richest And Poorest Is Wider Than Previously Thought, Oxfam Says : The Two-Way Last year, Oxfam said the world's richest 62 people had as much money as the poorest 3.6 billion. Turns out those numbers were wrong: The richest nine people had as much wealth as half the planet. 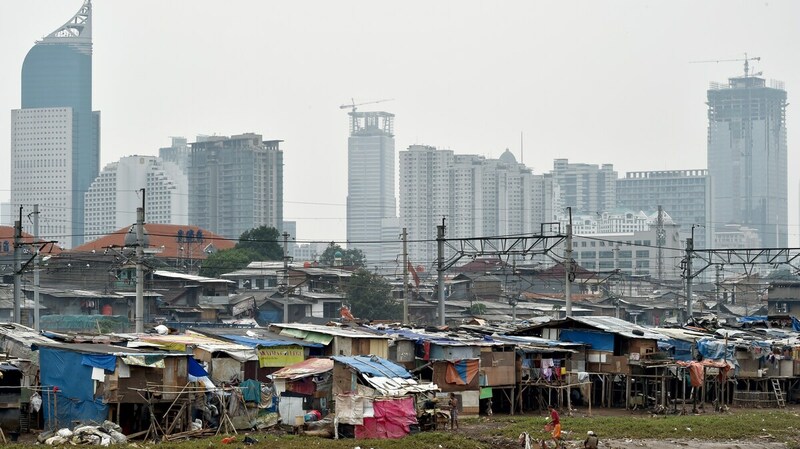 A 2014 photo shows shanty houses on a river bank in Jakarta, Indonesia, where Indonesian President Joko Widodo once pledged to close a fast-growing wealth gap. The numbers were also wrong, Oxfam announced Monday. Better data show that last year's report should have said that just nine billionaires possessed as much wealth as the poorest half of the planet in 2016. And this year, Oxfam says, you only need eight megarich men to balance the scales with the accumulated wealth of 3.6 billion people. The charitable organization's executive director describes the disparity as "obscene." "Inequality is trapping hundreds of millions in poverty," Winnie Byanyima said in a statement. "It is fracturing our societies and undermining democracy." Oxfam's headline-grabbing statistics, released shortly before the World Economic Forum began in Davos, Switzerland, are based on two sources: the Credit Suisse Global Wealth Databook, which looks at wealth distribution within countries, and Forbes' annual list of billionaires, which evaluates the assets of wealthy individuals. The most recent Credit Suisse Databook used "new and better data," especially on the distribution of wealth in India and China, to conclude that the world's poorest people possessed even less money than previously calculated. That meant a sudden shift in Oxfam's numbers, too. The poorer half of the world consists of 3.6 billion people with $409 billion, the group says. All the billionaires on the Forbes 2016 list — 1,810 people — possess as much wealth as a full 70 percent of the rest of the world, Oxfam concludes. Oxfam notes there are two common questions about its methodology. The first is whether the debt from wealthy people, like well-off U.S. citizens with large amounts of student loans, drags down the global wealth totals. Oxfam argues that the number of indebted income-rich people is "insignificant" on a global scale, and that the vast majority of people living in debt are actually poor, not just seemingly poor. The second is whether exchange rates distort the numbers, which are all converted into U.S. dollars for comparison's sake. Oxfam says exchange rates have fluctuated over the years, while the disparity shown by Credit Suisse has been "persistent." "By any measure, we are living in the age of the super-rich," the organization writes.